I wonder how many times other food bloggers make a dish, find a few minutes to take half-decent photos of it despite the urge to forget about blogging and just tuck in and then… just never write about it. I’ve got so many sets of photos that I was actually quite happy with, of food that tasted good and I still never found the motivation to put up here. This is what happened with this one. I’ve made a Pear and Frangipane Tart and a Caramelised Pear and Almond Cake before but now I’m quite glad they never made it onto the blog. Because this is better. You see, not only I made my own pastry, which already makes it a winner, it also contains alcohol, which is always a plus (even is such small quantities!) and it has an extra layer of goodness between the pastry and the frangipane: sweet and sharp rhubarb compote. Now, I can pretend it was my culinary genius that made me put rhubarb in the tart but, in reality, I had half a bowl of the stuff leftover and I couldn’t possibly bring myself to eat any more rhubarb yogurt. 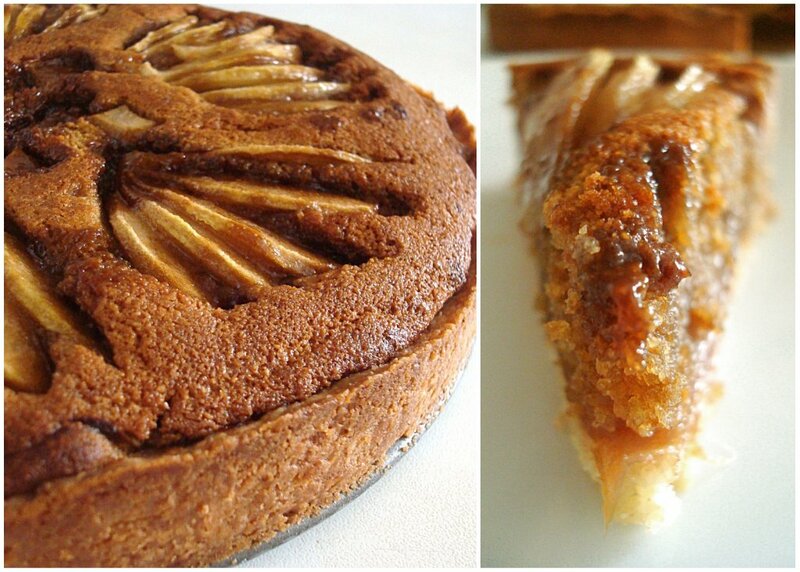 And a bit like this, the Rhubarb and Pear Frangipane Tart was born! I’ve combined several recipes that I have used in the past and I think this works quite nicely. The rhubarb is sharp, the almond filling sweet and nutty and the tart crust crumbly. If I could change one thing, it would be the way I prepared my pears. Next time, instead of just popping them on the top and drizzling with sugary butter, I’ll caramelise them first on the hob to make sure they are soft by the time the tart is cooked. Combine butter and sugar in a food processor until light and fluffy. 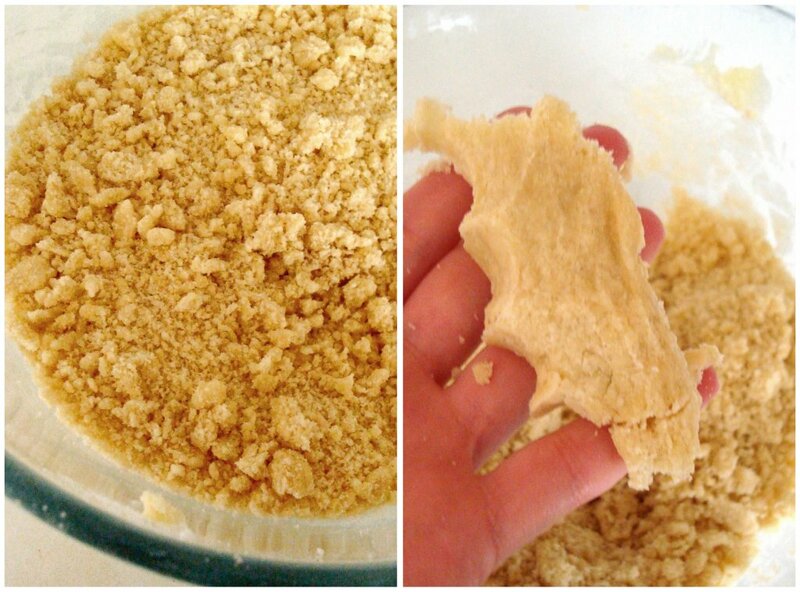 Add the flour and mix until you get a crumb-like dough. Add the vinegar and the milk and pulse to incorporate. At this point the dough should have crumb-like consistency (check! ), but clump if you squeeze it together in your hand (check!). And also, smell pretty disgustingly of vinegar (check…). I believed Clotilde when she said that the smell would disappear during baking and proceeded happily. 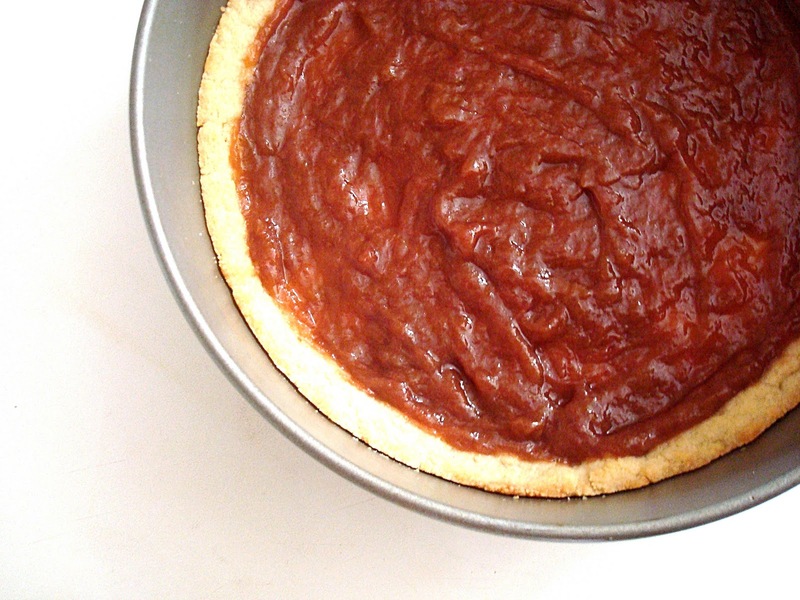 Empty the dough crumbs in a tart dish (or a cake tin which is what I did) and spread evenly along the bottom to form a crust. Keep some extra along the edges to mold it into a low rim. Do not worry too much about making it completely even. Blind-bake it in a 170 degree oven for 15 minutes and let it cool slightly. Cook the rhubarb and the wine on the hob until the rhubarb is soft. Add sugar to taste and continue to simmer until all lumps of rhubarb have been mixed in and you have a smooth paste. Spread evenly onto the pastry. Mix all the ingredients together in the food processor or by using an electric hand whisk until smooth. I didn’t worry too much about a few small lumps of brown sugar. Spread on top of the rhubarb compote. Peel the pears and slice them in quarters, removing the hard middle bit. Keeping the thin top intact, slice them to the bottom and fan them out. Arrange on top of the frangipane. Melt the butter with the sugar. Cook in a preheated oven for 15 minutes at 170 degrees, then take it out and quickly drizzle the melted butter over the pears to stop them from drying out. Place back in the oven and cook for a further 20 minutes or until the frangipane mixture is set and the crust golden-brown. If you prefer, you can caramelise the pears in a pan before arranging on the tart and avoid the butter-drizzling half way into the baking. Or maybe ignore this step completely. The pears should be fine, especially if they were quite juicy to start with. When it’s done, remove the tin’s ring and let the tart cool. You can serve it while it’s still warm but I find that the flavours improve after it’s cooled down. Serve with vanilla ice-cream or clotted cream. Even though I had already had quite a lot, I couldn’t resist a slice of it plain, with a cup of tea in the afternoon. I know the recipe looks a little bit long but it really isn’t very complicated at all and it takes very little time. If you want to make it quicker you can use ready-made sweet shortcrust pastry, although making your own is pretty easy and the taste and texture is almost certainly superior to the store-bought. 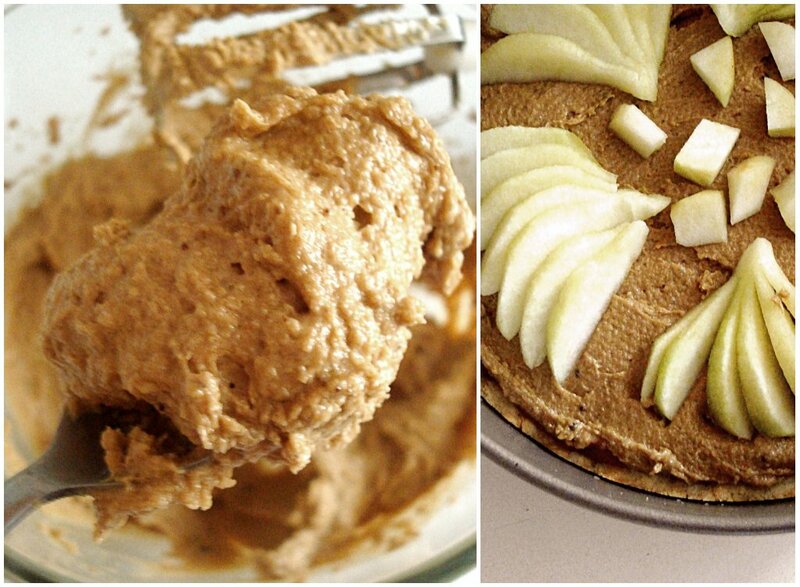 You can make both fillings while the pastry is blind-baking and cooling down, do your clearing up while the whole thing is baking and then you’re ready to enjoy a lovely slice of tart, sweet, nutty, fruity goodness. Gorgeous tart! I bet it tastes sooo good! 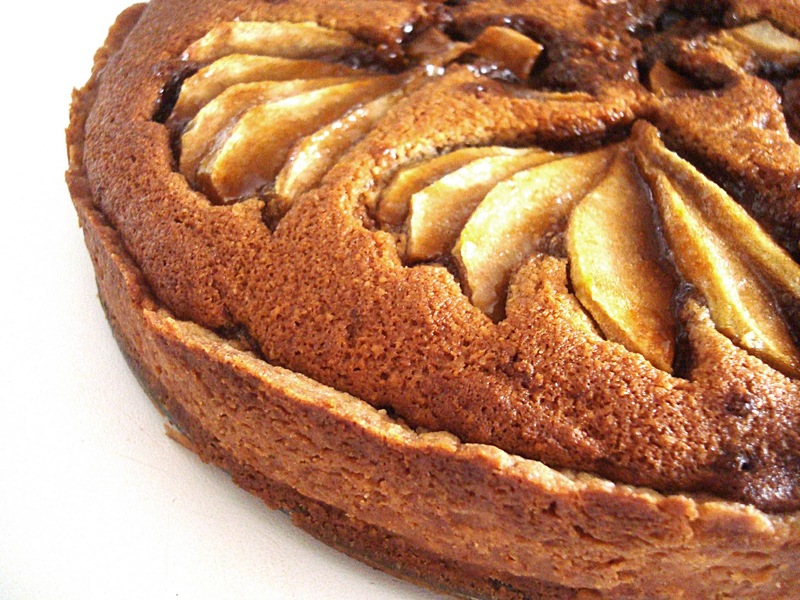 It looks so delicious….I love all the ingredients you used…..almonds, rhubarb,pear, amaretto….yum! Thanks to both of you 🙂 There are so many of my favourite things in this tart, I think it's going to become a regular! Rhubarb is my absolute favorite. Your tart looks amazing! Great tart! 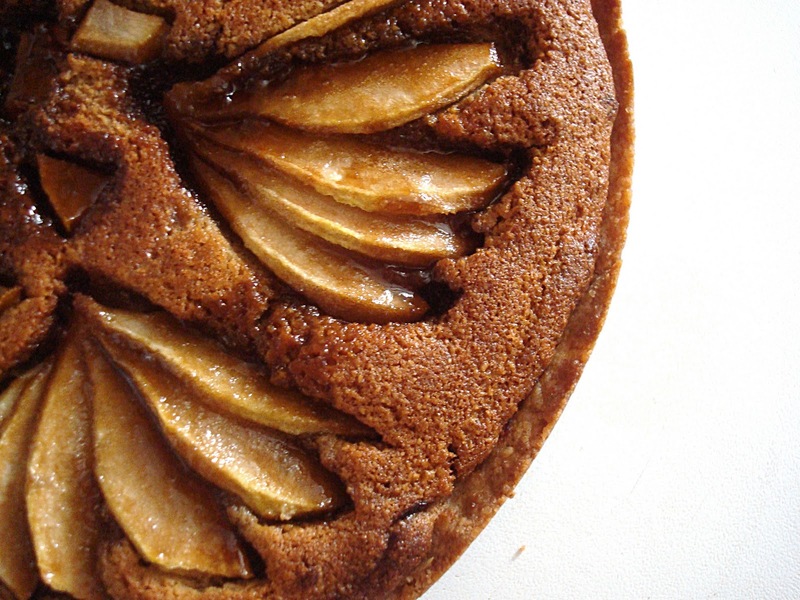 I love frangipan toppings and have tarditionally done one with just either cooked apples or an apple compote (almost apple sauce) in a pastry shell. I love rhubarb too, so will definitely try this. Ino – how beautiful! I love the idea of matching frangipane with the rhubarb and pear. Your tart look so great! I never try rhubarb but I think it's must be yummy! I was looking for a recipe to use up some ripe pears I bought at reduced price and rhubarb growing in the garden of a house I have recently moved into – this seems to fit the bill! I made the Martha Stewart recipe for her Pear Frangipane Tart, which was wonderful. I love the idea of using rhubard in it. I will absolutely add this.